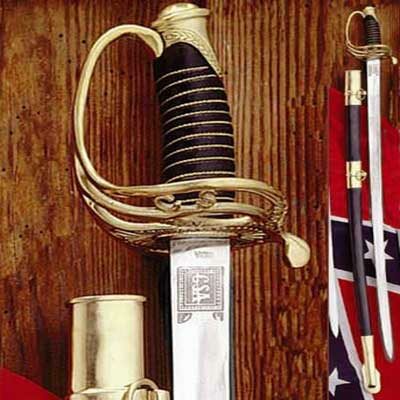 Confederate Officer Swords for sale are 38 inches in all. These handmade Confederate Officer Swords are inspired by the historical saber carried by General Jo Shelby. This modern version features a hand forged fully tempered 1095 high carbon steel blade. The functional and flexible 32 inch blade is acid etched with the initials CSA. The historical details of the piece include the original style of the handle and the use of traditional materials for the scabbard. The genuine leather grip features an authentic style brass wire wrap. The letters CS are cast onto the guard. The scabbard is crafted of blued steel with brass throat, rings, mounts and drag. Buy the Confederate Cavalry Officer Swords for $149.99.